Unfortunately, due to the orientation of the original photograph, you can't see the rest of the hood of the truck which has a message scrawled into the snow that says, "De-ice me!" Hundreds of flights have been grounded at both Dallas-Fort Worth International Airport and Love Field Airport Tuesday morning due to ice and snow. The National Weather Service on Tuesday extended a winter weather advisory for the Dallas-Fort Worth area until noon as a wintry mix of drizzle, snow, sleet and graupel is expected to fall until around 11 a.m. -- though it will diminish significantly after 9 a.m.
Southwest Airlines spokesperson Whitney Eichinger said the airline halted all flights at Love Field Tuesday morning but was able to resume operations earlier than expected -- shortly before 8 a.m.
Southwest said they suspended operations until about 10 a.m., after which they returned to a normal schedule. 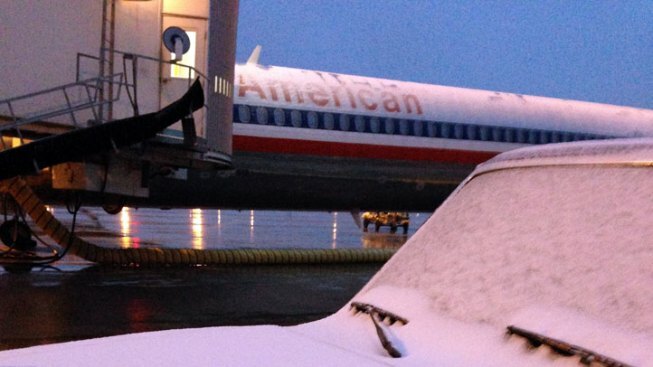 Fort Worth-based American Airlines said both AA and American Eagle have together canceled approximately 340 flights out of DFW Tuesday due to weather. DFW airport remains open as carriers work to de-ice their planes, airport spokesperson David Magana said.